Editor’s Note: All five 3rd District Aldermanic Candidates were invited to respond to the following questions using their choice of e-mail, telephone, or a personal interview. (interviewed by Currents staff) Age: 41 Family: Wife Becky, children Jack, 12, Lily, 9, Nic, 5 Hobbies: Soccer, reading (non-fiction). Education: UW-Madison, political science. Resides: On Summit near UWM. Last time on the city bus: Last week. Most important problems confronting Riverwest: We need continued vigilance on crime, especially around Locust and Center. Need to encourage more locally owned businesses to be successful and add vitality to the surrounding neighborhood. We need to upgrade pockets of the neighborhood that are blighted and assist redevelopment (infill development — no tear-downs). Making the best possible use of our public spaces. Experience: As alderman, I’ve worked with people on each and every block of Riverwest to help with problems from bad landlords to crime. I’ve been a leader in city government for eight years, making sure Milwaukee is treated fairly at the state level and that all the citizens in Milwaukee are treated with the same respect as those people in other parts of the state. I’ve done the job for eight years and done it well, not only on a daily basis but on a visionary basis — helping give direction to where the city is going. Why do you want to hold this office? Because I love my job — I love working with people, I love solving problems, and I like to drive home every day and see something we’ve been able to change or improve. There’s still work to be done and I’d like to see the Center Street project through, along with the redevelopment of the Johnson Controls site into single-family housing. I would like to continue working with neighborhood groups to improve things. Why should people vote for you? Because I’ve proven over the past two terms to be responsive, to take leadership positions on tough issues, and to also provide my constituents with the information that’s needed to be active participants in the decisions that affect their neighborhoods. How are you different from the other candidates? I figured out the other day that I have attended over 1500 neighborhood and business association meetings in the last eight years. That gives me a certain knowledge and experience that no one else can offer. Key issues: I will continue to fight for increased state aid so we can bring our tax rate down. I will work with the police chief to reconfigure police district lines and put more back into community policing. I want to work with business groups and residents to revitalize Center Street and Locust Street. I also want to work with first-time home owners to improve the housing stock and increase homeownership. If we can achieve the same percentage of home ownership in the southern end of the neighborhood as in the northern part, that would be great. Favorite political philosopher: No single individual. Proper role of city government: I believe in public service, public schools, public parks, quality public spaces, public libraries, public art, and public transportation — all publicly funded, accessible, and supported. It is the job of city government to make sure that public amenities in the city are done in such a way that they improve the quality of life and attract people to raise their families, start a business, and recreate. That’s the advantage that cities have over suburbs and other localities — their public amenities are far superior, and the diversity of the population. It’s an exciting mix of people, places, and things. How to make government decision-making more transparent and participatory: I sponsored an ordinance to give greater notice of zoning changes. We send multiple notices out for things such as new liquor licenses, any development that requires variance or special use, any significant development that includes public money or public land. We try to be as inclusive as possible. I am always open to suggestions on how to include more people in the decision-making process. I hardly make a change in a neighborhood without having the issue go before the neighborhood organization, so I depend heavily on active neighborhood leaders to help me in my decision-making. It is also the responsibility of the citizens to be involved in local neighborhood organizations so they can participate in decision-making. 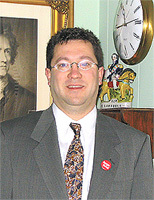 What accomplishments as alderman are you most proud of? That I’ve always provided my constituents with the information they need to participate in decisions affecting their neighborhood, then I take that input to determine what is in the best long-term interest of the neighborhood and city as a whole. I have never made a decision based on a short-term advantage. I helped lead the fight against Jewel-Osco. I opposed Wal-Mart coming to Capitol Drive. This opposition was based on the long-term health of the city. I’m also proud of the city’s role in giving new life to the Kohl’s on Holton (now Lena’s Grocery), the revitalization of Gordon Park and Baby Park (Snail’s Crossing), and securing $750,000 to acquire the remainder of the railroad right-of-way from Burleigh to Keefe. I have led the fight for ethics and honesty in city government, requiring bank statements to be supplied to the election commission twice a year by all elected officials. Additional comments: Since 1996 when I was elected, homeownership is up, crime is down, property values are up, and taxes have risen at a rate that is slower than the rate of inflation. 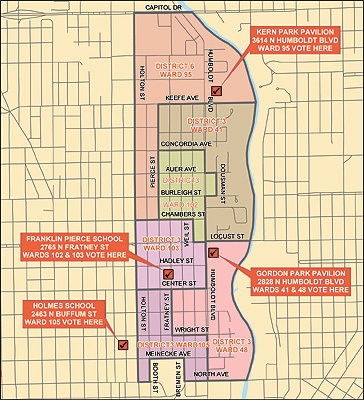 Before I took office, virtually all of Riverwest was zoned multi-family; now it is mostly single- or two-family. This change in zoning is the single biggest tool we have to preserve the character of this area. (e-mail response) Age: 20 Family: Parents Robert and Julie, sister Jamie. Hobbies: I enjoy watching athletic events, surfing the internet, reading, going to the movies, playing chess, and visiting with my family. Education: K-12 Adams-Friendship Area Schools. I am currently a 3.84 Honors student at UW-Milwaukee majoring in Political Science and Philosophy. Resides: On the Eastside near UWM. Last time on the city bus: Since School got out for Christmas break, I’ve done a lot of walking within the district. I’d estimate that it’s been a month since I’ve used the service. Most important problems confronting Riverwest: One problem I’ve found is the fear of crime. Prospective and current citizens are complaining of drug dealing, gangs, and guns to be extremely prevalent in the Riverwest area. To combat this problem we must increase communication between homeowners and law enforcement. This will allow homeowners to know and respect their protectors along with being able to voice their problems and not allow such crimes to continue to occur. Another issue affecting Riverwest’s citizens is Gentrification. We are driving families and homeowners to leave where they grew up. The answer for development is not to bring in new citizens. It is to employ and increase the quality of life of the current citizens. Experience: I worked as an assistant to a County Clerk for two years. I won the right to compete on a national level representing Wisconsin in the category of Marketing Management. I have run for County Board Supervisor and tied a 31-year incumbent, losing in a card draw. I have had many jobs that have hinged upon my communication skills. I feel communication is very important to any job, especially one that caters to the public. Why do you want to hold this office? As Alderman I would maintain and improve housing options in the area. I believe that both Milwaukee and myself can benefit from me becoming Alderman. Together we can create a better and more beautiful Milwaukee. Why should people vote for you? I am a candidate willing to take real issues head-on. I will lend my ear to any citizen who asks for it. I will think out the effects of solutions that appear to be quick fixes but are actually long-term damages. I value honesty above all other qualities and I will strive for it all the way through my Aldermanic term from beginning to end. In essence I feel I embody, and would love to be referred to as “the People’s Candidate.” That is who I am and that is whom I represent: The People. How are you different from the other candidates? The first thing people will point to is my age, and that I am a student. I am guilty of both, but all that it means is that I am dedicated to improving myself and my community by learning. We should all be students in some form, whether we learn how to use a new program at work or have our spouse show us how to change a flat tire. Learning is essential to improvement and improvement is essential to Milwaukee. Key issues: A large issue I’d like to focus on is the new ordinance proposed by Ald. Mike D’Amato restricting student housing. This will restrict and harm our whole district from residents to businesses. Restriction is not the answer. We can’t take problems and just move them across the river. Riverwest is not and cannot become a dumping ground. Another key issue affecting our district is the lack of parking for residents, consumers, and students. We must continue with a productive search to actually create spots without losing our greenspace. Favorite political philosopher: I’m fond of J. S. Mill’s foundations of utilitarianism in On Liberty and Mancur Olson’s idea of Stationary Bandits. Proper role of city government: Government was created to serve the people. I see no reason why it should not continue from this intention to do so. Great care must be taken by leaders to provide an environment that will foster and harbor growth by its citizens and city. Making government decision-making more transparent and participatory: Communication is the responsibility of citizens and Governmental leaders alike. Great strides have been made in the last ten years, with the largest being the internet. Citizens are able to look up legislation that their Alderman sponsors, and Aldermen can be accessed easily through e-mail or cell phones. I encourage citizens to contact their Alderman with their concerns and thoughts on how our city can be improved. I know that if I am elected Alderman, my door will always be open. Have you been to a Common Council meeting? Impressions/comments? I have viewed several meetings from the comforts of my own home through the help of Channel 25. I find the discussion at times to be quite productive and refreshing. There seemed to be tension between the Mayor and Aldermen on key budgetary issues. This is something I intend to fix right away. The Mayor, whomever it may be, will be my partner and not my opponent. (e-mail response) Age: 23 Family: Fiance Jennifer and son Levon. Hobbies: I am dedicated to too many things to really call anything a hobby. Education: Graduate of Walden III Alternative High school-Racine, WI ; Three years of college at UW-Parkside majoring in Music Education. Resides: In Riverwest (Fratney and Clark). Last time on the city bus: In December. Most important problems confronting Riverwest: To scratch the surface I would say: lack of solutions, gentrification, and crime. Experience: I have been involved in Politics from early on, and will be involved for the rest of my life. I have researched the role of government and its problems since the beginning of high school. Where I lack office holding experience, I make up for in compassion and ability. Why do you want to hold this office? I am not in the race just to bash the incumbent; I actually want to hold office. My intentions are that of someone who will ensure true change and that ALL the needs of the residents are addressed. I have ideas and vision that I will put forth, and fight for in or out of office. Why should people vote for you? I have been dedicated to working for the constitutional right of everyone’s liberty and the pursuit of happiness. My focus is to educate people on how problems on the federal level are closely related to the local role of government, and that is where we start to find solutions. Like Kucinich, my platform mirrors the Green Party platform for one reason alone: it is the politics of common sense. The element of common sense has been far removed from City Hall. Money and corruption have become commonplace and no matter how nice an official may seem, it doesn’t hide the blinders they have put on the needs of the less-than-affluent. My work is to bring ways for government to change the social climate that is the result of the segregation and class discrimination that have been ignored for too long. How are you different from the other candidates? I am looking to represent the people working to bridge the poverty and education gaps. Also, I want to do this without continuing the pandering to special interests (i.e. developers and irresponsible business). “Downtown for Everyone” is not a slogan; it’s a pledge that no matter what the outcome I will work to change policy to ensure that the Milwaukee quality of life improvement trumps the growth of the condos. This way we can make more property owners, and business people that live in Milwaukee instead of trying to attract the suburbanites. Key issues: Ending gentrification, ending overnight parking tickets, living wage jobs, true transparency. Favorite political philosopher: Martin Luther King Jr., Dr. John Longeway (my old philosophy professor), Noam Chomsky. Proper role of City Government: City government’s role is to serve the public which can no longer be selective. How can we make government decision-making more transparent and participatory? More things voted on in a public referendum. We hold town-hall style meetings, with alderpersons that actually benefit from public knowledge of issues. Have you been to a Common Council meeting? Impressions/comments? No, but I have been reviewing minutes. Additional comments: No one can claim success amid such poverty, homelessness, joblessness, and crime. This is true regardless of the Riverwalk; there are too many poor development choices. (e-mail response) Age: 37 Family: Two God Children, one dog, one Father (retired small Farmer) and two sisters Hobbies: English Horse Riding, Antique Collecting, Gardening, Reading Education: University of Wisconsin Superior and Milwaukee, Ealing University- London England Resides: In Riverwest (Meinecke). Last time on the city bus: I rode a bus the last week in November. 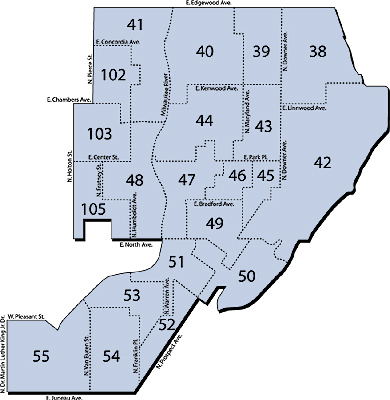 Most important problems confronting Riverwest: The amount of crime that takes place here. Crime promotes fear and fear keeps people from coming into and enjoying our neighborhood. Another concern I have for the people of Riverwest is the cost of living. Property taxes and cost of living keep rising in double digit increases. Rents are going up because landlords need to cover their increased costs. Gentrification is a real issue facing our community. People are finding it hard to live in a place they love to call home. Experience: The experience I bring with me is 10 years of management skills. I have had to work with profit and loss statements, budgets, customer service skills, and employee relations. Along with this I bring my knowledge of working with neighborhood organizations and issues relating to our neighborhood. Why do you want to hold this office? I chose to get into this race to give people hope for a better tomorrow. Hope for a friendlier and safer neighborhood, hope for secure jobs. Hope for a home to call their own. That is my hope for the future of our city and I would like to help make it happen. Why should people vote for you? People should vote for me because I am a person that listens to them. I realize that this job is not about me, but about we. That is why I have proposed a citizen’s panel. I want to hear from as many people as possible and figure out what is best for our neighborhood by listening. I know I don’t have all the answers but someone out there does. It is my belief that if we work as a team, we all win. How are you different from the other candidates? I am different from other candidates for two reasons. One is that I am not part of any special interest group, and two, I do not want to use this position as a stepping stone for another political office. Key issues: Property tax relief, crime reduction, and the next city budget. I have been working on crime issues in our neighborhood for a long time. We need to make sure that our police force is staffed appropriately. We need to encourage citizens to start block watch groups to help protect each other and create a network for safety. Our homeowners need property tax relief. Taxes just keep going up along with service fees and gas and electricity. It is becoming difficult for retired persons and people in the lower economic brackets to live in a home of their own. Home ownership builds stability in a neighborhood. I would love for more people to own homes but the reality is they can’t afford a home. It is not because of the mortgage payment but because of the insurance and the taxes. Should someone have to sell a home they have lived in for years because the taxes have forced them out? The next city budget is already predicted to be $5-10 million short by the city comptroller. We need to decide if we want a tax and spend government or a fiscally responsible one. Favorite political philosopher: I have two people I admire in American Politics. One is Jimmy Carter. I admire him for his soul and his heart. He has given a lifetime of service for love and the betterment of his fellow man. The second is Thomas Jefferson. I admire him for his thoughts. He was a statesman, a philosopher, an architect, an inventor and a gardener. Thomas Jefferson was a man that never tired of thinking about ways to improve the world he lived in. Proper role of City Government: To insure the safety and livability of its city. How to make government decision-making more transparent and participatory: I have proposed a citizen’s panel to help me make the government more participatory. I also think that city government should do more citizen surveys. An example would be to rate these city services in order of importance. Have you been to a Common Council meeting? Impressions/comments? Yes I have been to a common council meeting and I have been watching them on the television. It seems to me that most of the decisions are made somewhere else. The council meetings are just the public records end of a discussion. The committee meetings are much more informative and worth viewing. (e-mail response) Age: 44 Family: Single. Hobbies: Photography, cooking, bike riding. Education: BA-psych from UWM. Resides: In a duplex on Frederick. Last time on the city bus: Last summer. Most important problems confronting Riverwest: Crime, green space, neighborhood say in developments. Experience: I am a successful business person in the district and have knowledge of City Hall through my business. Why do you want to hold this office? For the good of our district. Why should people vote for you? I want to bring the office back to the people and make City Hall more accessible. I would have an office in the district (at my cost) so people can talk to me directly about their concerns. How are you different from the other candidates? I have practical experience on what is needed to run a business and make it in our district and know the everyday problems people encounter when working with the City. Key issues: Many. A few are: equally representing all constituents, control City spending, creating a better relationship with the people in the district and City Hall. Proper role of City Government: To fairly represent the people and to listen to their needs. Making government decision-making more transparent and participatory: By having better communication and accountability Have you been to a Common Council meeting? Impressions/comments? Yes and I love to watch them on TV. My impression is that for many issues the outcome is already decided and the meeting is just a formality. Additional comment: Our common council may have no females as of 2004 and I think it is important to have some representation.